Loaded with homemade smoky vegan cheddar cheese sauce and topped with sour cream, these twice-baked potatoes are the ultimate comfort food. 1. Baked Potatoes: Preheat oven to 375° F. Rub potatoes with olive oil and salt, and place on a sheet pan lined with parchment paper. Pierce each potato several times with a fork. Bake for 70 minutes until soft. 2. Vegan Cheddar Cheese Sauce: In a sauté pan over medium heat, add coconut oil and onion. Cook for 5 minutes. Add beans, carrots, garlic, paprika, and salt. Sauté for 5 minutes. Add water and cashews, and bring to a boil. Cover pan and simmer for 20 minutes, or until vegetables are very soft. Transfer entire contents to a blender along with mustard and lemon juice. Process until cheese sauce is velvety smooth. Transfer to a medium bowl and set aside. 3. Cashew Sour Cream: In a blender process cashews, water, miso, and vinegar until completely smooth. 4. Potato Skins: Remove baked potatoes from oven and cut in half, lengthwise. Using a spoon, carefully scoop out potatoes from skins, leaving 1/4-inch layer of potato. Brush insides of potato shells with remaining olive oil and return to the oven for 15 minutes. 5. Mashed Potato Filling: In a medium bowl, mash potato filling with vegan butter, non-dairy milk, salt and pepper. Fold in half the cheese sauce, half the sour cream, and half the scallions. 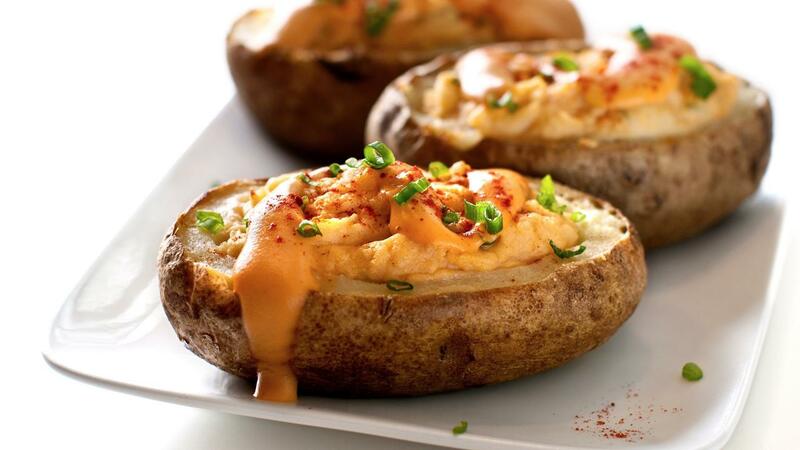 Fill each baked potato skin with mashed potato mixture. Top with a dollop of cheese sauce and a drizzle of sour cream. Garnish with remaining scallions and pepper as desired. 6. Bake loaded potato skins for 15 minutes, until thoroughly heated and tops are browned. Serve warm and enjoy! Create each section individually and you'll have three delicious recipes to use individually or to mix and match with others—the vegan smoky cheddar cheese sauce, cashew sour cream, and mashed potatoes are easily prepared as individual side dishes. © Recipe by Allison Rivers Samson, Self-care Coach, award-winning vegan chef and author of Quick + Easy DIY Salad Bar, The Dairy-Freedom Cookbook, Comfortably Yum, and Co-Founder of The Dairy Detox.